Youth In Nursing Homes Seek Alternative Care Young people are a growing percentage of nursing home residents. But despite alternatives for long-term care, many remain in nursing facilities. In a hotel ballroom outside Atlanta, a young man glides his wheelchair to the front of the meeting room. With his twisted hand he hits a button on a small gray box attached to the front of the chair and a machine speaks for him. "I am Mathew Harp, and I am 22 years old." The voice from the machine is crisp, modulated and not too mechanical. Harp has a muscle disorder and cannot speak, so he types his speech into the machine. "I have a lot of special needs," he says, "and when I was 21 years old, I had to move into a nursing home because my mother and my sisters could not take care of me by themselves any longer." Picture a nursing home and you think of a place for the elderly. But yearly federal nursing home data shows that there are more than 6,000 young people up to the age of 21 living in American nursing homes. And there are thousands more who are in their early 20s. This spring, Harp gave a speech to a group of Georgia parents whose children are living in nursing facilities. It was part of the Children's Freedom Initiative, an effort by a group of Georgia disability advocates to track down every child in the state living in a nursing home and show their parents alternatives to nursing-home placement. For Harp, the nursing home was an unhappy place. "I was the youngest person in the nursing home. Most of the others were very old. I had only a few friends that would come and see me. I missed everyone very much," he says. "And I wanted to leave. I wanted to live with my family so that I would not miss them so much." After a year in the nursing home, Harp got his wish and, in March, he moved back into his mother's home. That was possible because a state and federal program paid for the aides who come to his house nine hours every day. They help him get up, get dressed and eat. Harp's speech was followed the next day by a van tour also organized by the Children's Freedom Initiative to showcase alternatives to long-term care in a nursing home. "Today I hope that the families will just be able to develop a vision for what's possible for their children to live a life in the community," Katie Chandler says before the tour. She works for the Georgia Advocacy Office, a disability legal group, and as part of her advocacy, helped start the Children's Freedom Initiative. Chandler tracked down more than 80 children and young adults from Georgia who live in state hospitals and nursing homes and then invited some of their parents on the tour. She told the parents that even children with the most severe disabilities can get good -- and even better -- care outside of a nursing home. Chandler says someone who needs 24-hour care may not actually be getting that in a nursing home; the person may be seeing an actual nurse only 15 minutes a day. "So what you're really getting is CNA care, the certified nursing assistant," she says. "They help you with your physical needs [getting in and out of a wheelchair, bathing and eating] and that can easily be done in the community." The van tour visited a group home, a family who cares for their son with state-paid nurses in their own home, and an adult foster home. On the tour was 23-year-old Bylon Alexander, of Athens, Georgia. When she was 6, she suffered a stroke. Her mother cared for her at home, but got sick and was hospitalized. So at the age of 22, Alexander entered a nursing home. "Just recently," she says, putting a pause between each word, "my mom died." The day of the funeral, aides at the nursing home got Alexander dressed, but the van that was supposed to take her never showed up and she missed her mother's funeral. Now, she worries she's in the nursing home to stay. "I don't have anyone to take care of me. So I think I'm stuck where I'm at," she says. Many of the 1.5 million people who live in nursing homes, however, say they do want to live in a facility. They may have disabilities so complex that the nursing home is the place they feel they get the best care. And even for people like Alexander, who want the choice to leave, it was the nursing home that provided a solution when there was no other place to go. Also along on the tour are Sally Carter and Bobbie Davidson. They once held top positions at state institutions for people with disabilities. At first they were skeptical that the people they looked after could get good care in their own homes, but not anymore. Now, as consultants for the state, they help people with disabilities negotiate the tricky bureaucracy of getting out of institutions and nursing homes. Can anybody get out of an institution or a nursing home and live in a group home like the one on the tour? "Yes," Carter says, "with the right supports. Absolutely." Davidson adds, "It's cheaper in most cases." In Georgia, it costs more to provide care at home less than 3 percent of the time, she says. Parents on the tour mostly say their children ended up in a nursing home because they had no other choice. For Nola Sayne it happened 13 years ago. 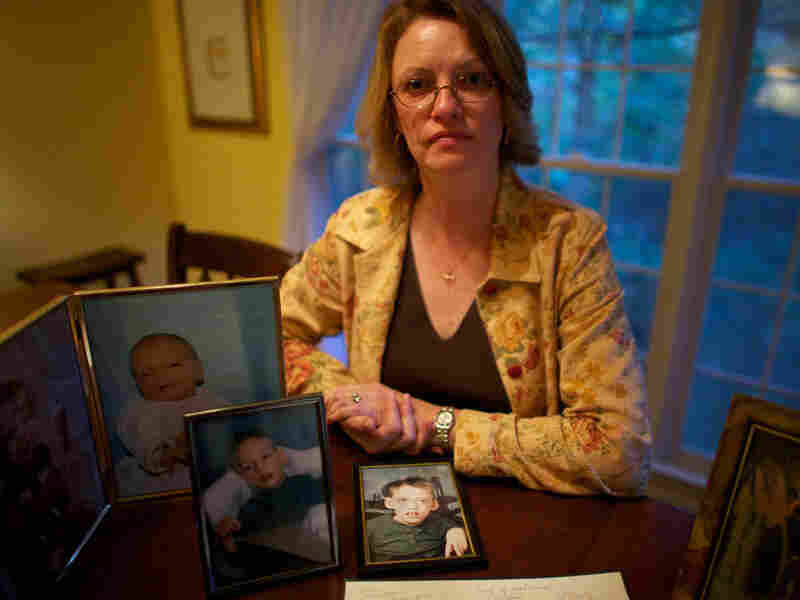 Her son Zach, now 23, was just 10 when he had a feeding tube inserted into his stomach. His after-school program kicked him out when staff said they could not do the feedings, and no other after-school program would take him. Zach has cerebral palsey, has seizures and is partially blind. Sayne placed a want ad in the paper and found an older woman who said she'd take Zach into her home day care. But it didn't last. After a week, the woman called her and said to come get him. Sayne found him sitting on the porch with his things. "She was in the house. She opened up the door when I came and said, 'I'm sorry,' and she was in tears," Sayne says. "Then she slammed the door. I didn't know what to do." Sayne thought about quitting her job as a paralegal, but she was a single mother then with two kids. She needed her salary and health insurance for Zach. The state of Georgia would provide help only if he lived in a nursing home, so Sayne took her severely disabled son to one. Making the decision to do this, she says, "was really hard. Very, very depressing." The closest nursing home that would take Zach was in Montgomery, Ala., a 400-mile round trip from their home. For the past 13 years, Sayne has made that drive every two or three weeks. When Zach is sick and hospitalized, she's taken off from work and stayed with him for days at a time. Now, she wants her medically fragile son to live closer to her near Atlanta. "If he is sick, I'll be able to be there quickly," she says. "I won't have to worry about will I make it in time. Because with him, you know, he's had pneumonia so many times, and he could take a turn for the worse very quickly. And I've always worried about being able to get to him. I don't want him to die without me. Just to be blunt about it." When the tour makes its way to a "host" home -- a kind of adult foster care -- Sayne can see a potential option. The home is run by a woman who quit her job at a hospital and gets paid to take care of four disabled girls 24 hours a day. "It gives me a lot of hope, actually," Sayne says. "I'm excited." But leaving a nursing home isn't easy. In October, Sayne received a disturbing letter in the mail. The Catholic order that runs her son's pediatric nursing home announced it was out of money and sold it to a private company. The new company is providing good care and has assured Sayne there is no pressure for Zach to leave. But there's a Catch 22: Because Zach has lived in a nursing home in another state for 13 years, and because he's now an adult, he's no longer considered a citizen of Georgia. It will be hard to get him onto Georgia's Medicaid program and closer to home. It won't be easy, either, for Alexander, who ended up in a nursing home after her mother died. She got state approval to move out of the nursing home and into her own home, so she made it a goal to move out by her 24th birthday. That was at the end of October. 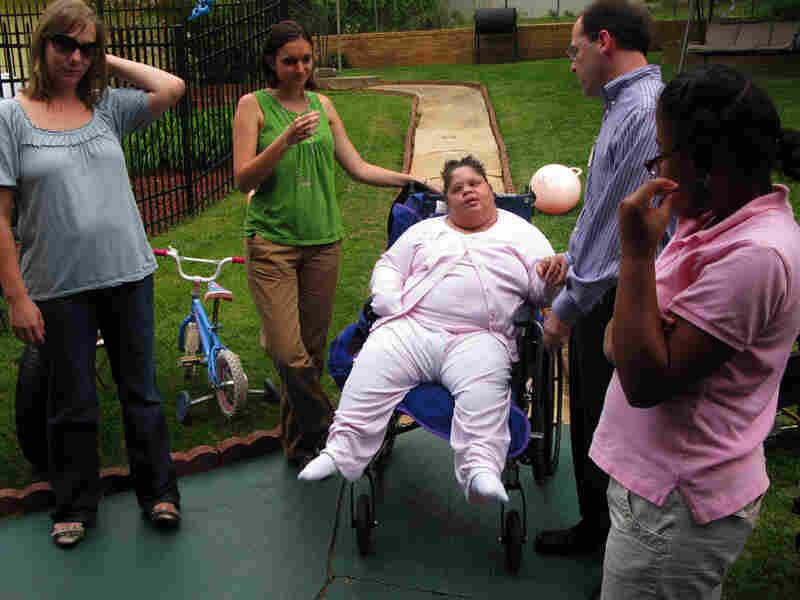 She's on a long waiting list for aides and for a wheelchair-accessible apartment.